Take a comprehensive tour of the industry’s most powerful monitoring and targeting software – the Cision Communications Cloud®. Understand your brand’s impact: Find out what people are saying about your brand vs. the competition. Build, edit, and delete keyword searches to quickly ingest relevant media content and respond to the rapidly changing news environment in real-time. Leverage comprehensive analytics for a user-friendly interface to filter and build more creative charts. 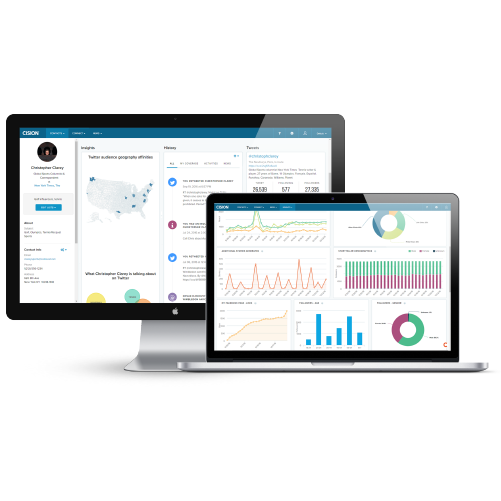 Harness shareable, customizable reporting without sacrificing your valuable time. Create customized, dynamic content templates. Sort, add, and delete tags across your entire system from a single interface, streamlining the organization of news clips. Manage a smooth list experience with insights, sorting options with grid view, and more filters to locate the right influencers. Share, download, and edit capabilities reducing manual touch points while taking full advantage of data. Use full screen views and chart notes for in-dashboard presentations, avoiding the hassle of PowerPoint. Join Andrea and Lee to discover how our intuitive platform empowers you to show your value, while improving your workflow, using cutting-edge advanced analytics and targeting capabilities. Director of Product Marketing at Cision Andrea Rosi is the Director of Product Marketing for the Cision Communications Cloud®. She comes from a background in the Martech space, with 5+ years spent focused on marketing automation, content marketing, and personalization software. At Cision, she leads a team in the creation of product messaging and Go-To-Market activities to drive engagement with existing and future customers. Product Marketing Manager at Cision Lee Ribeiro is a Product Marketing Manager at Cision, where he manages content and communication channels between product and sales teams regarding product updates, new features, and positioning towards B2B and B2C audiences.